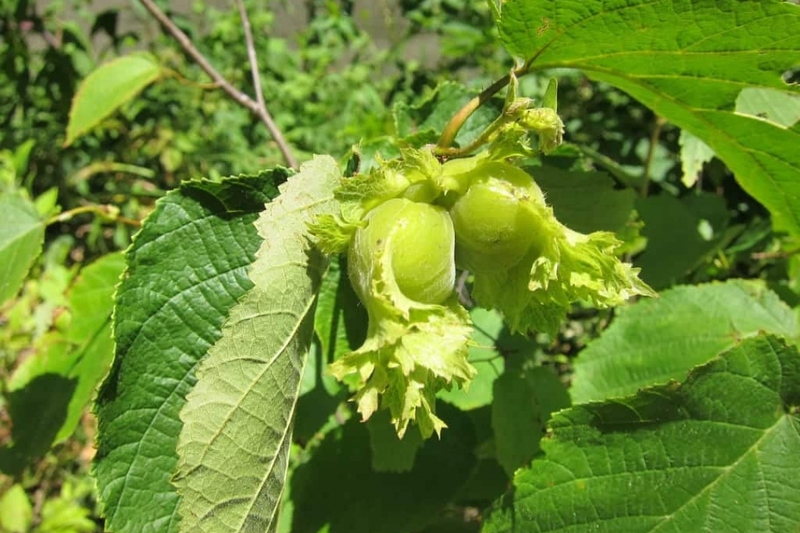 Hazel Tree (Corylus avellana): growing, planting, caring. Hazel trees are easy to grow in ordinary soil and will feed your squirrels (or you!) hazelnuts. The hazel tree can be planted in autumn in a sunny spot, in ordinary soil that's not too heavy. In the wild, it's a pioneer species that decays slowly once dominated by the foliage of a tree. They should be planted in pairs, in different varieties, with simultaneous flowering for a better yield. Hazel trees can grow to 5 meters in every direction, so be sure to leave them some room! Hazel trees are actually tufted shrubs that reach 5 m of height, with serrated, cordiform, deciduous leaves that end in a point. It flowers between January to March — the male flowers are hanging yellow puffs and the female flowers form straight ears. The fruits are membranous, cup-shaped achenes. There are winding, tangled varieties with purple foliage. Plant from the end of autumn to the beginning of spring, in well-drained soil and sun. Don't bury the base of the stems too deeply, tamp down the earth around the roots. Form a shallow basin and water until no more can be absorbed. Plant two simultaneously flowering hazel trees of different species to allow pollination. In September or October, don't forget to harvest your hazelnuts! They can be harvested once the fruit breaks away from the bush and falls to the ground. Let them dry in the fresh air for a while before eating them, but don't leave them in the sun. If your hazelnuts are full of holes or empty, it's because of nut weevils! They lodge themselves inside of the hazelnuts and devour them whole. Nut weevils hide underground for the winter, then return in the spring. Try hoeing the soil at the foot of the tree in the winter to get rid of them. Even the weakest frost will be too much for them to survive and you'll be rid of them! If you don't have enough space for an adult hazel tree, prune the branchs moderately in March each year, limiting their height to two meters. Completely cut off old, crossed, and dead branches. N.B. — hazel trees don't like overly severe pruning, so if you forget to do it one year, don't try to make up for it the following year by pruning too much, which can put it in serious trouble.